Nine decades after its founding, Café Bustelo is finding new fans and continuing to grow its distribution throughout the United States. 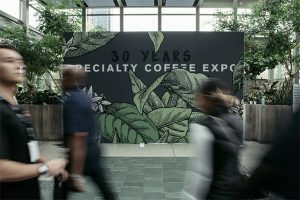 In honour of its 90th anniversary this year, Café Bustelo has been holding events in its key markets in the US. 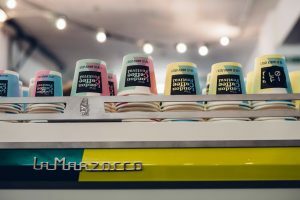 After events in cities such as Los Angeles, California, Miami, Florida, and Houston, Texas, among others, Café Bustelo returned to its roots – New York City – for a specially tailored event. Café Bustelo was founded in 1928 by Gregorio Bustelo, a Spaniard who travelled throughout Latin America before settling in New York. He opened the Bustelo Coffee Roasting Company at 1364 5th Avenue amidst the tenements and small business of NYC’s East Harlem neighbourhood known as “El Barrio,” now known as Spanish Harlem. It was one of the first coffee roasters to cater to all Latino communities. To celebrate its heritage and the neighbourhood where Café Bustelo was born, the brand, now owned by the JM Smucker Co, arranged a cultural walking tour of Spanish Harlem to explore the importance of Spanish Harlem in shaping NYC’s Latin community. The tour featured three of my favourite things: food, beverages (coffee and adult libations) and historical factoids provided by Spanish immigrant historian, Jim Fernandez, PhD, of New York University. Dr Fernandez noted that at the time Café Bustelo was established, Puerto Ricans were the largest demographic group in Spanish Harlem. 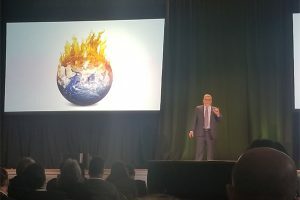 Now, the Puerto Rican population is declining as many residents have been relocating to Florida, while the Dominican and Mexican populations are on the rise in the neighbourhood. The migration to new markets has fueled Café Bustelo’s growth, but the brand has not forgotten its roots, and the tour through Spanish Harlem was designed to reflect that. The first stop on the tour was 80-year-old Valencia Bakery, where we tasted light, flaky, sweet pastelillos with guava or vanilla, and of course, Bustelo coffee. The next stop was La Marqueta, the 82-year-old marketplace offering Latino cuisine. There we sampled coffee-infused treats like flan prepared with cheese rather than egg, and more coffee. We also visited Casa Latina Music Shop (I can’t recall the last time I was in an actual music store) – a store long embedded in the community. Café Bustelo sponsored many stage shows and radio broadcasts of new music heard on the streets of Spanish Harlem during Gregorio Bustelo’s time. Given Señor Bustelo’s affinity for Cuba, our last stop was Amor Cubano, a restaurant with an authentic Havana feel, serving Cuban and Caribbean food. Among the many delicacies, we ate maduros, tostones, arroz con pollo, empanadas, lechon asado, mojitos…) and watched a presentation on how to prepare a cafecito, Cuban espresso. Though part of the same company that owns Folgers Coffee and the new 1850 Coffee, I did not know much about Café Bustelo. This “walk through history” was a fun, entertaining and educational way to learn Café Bustelo’s history and essence, and how its heritage informs the brand’s business today. 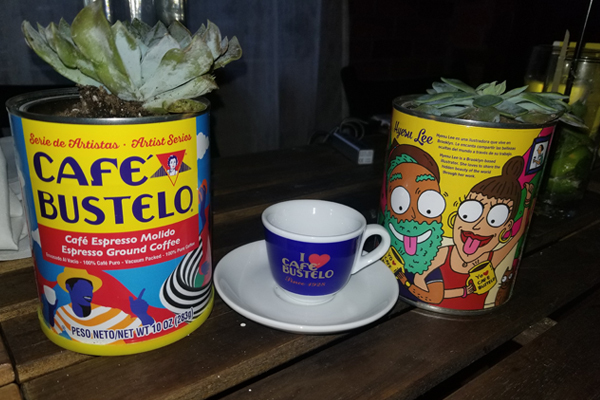 The coffee cans in the image are part of Artist Series of which the purchase helps support Café Bustelo El Café del Futuro Scholarship Program.